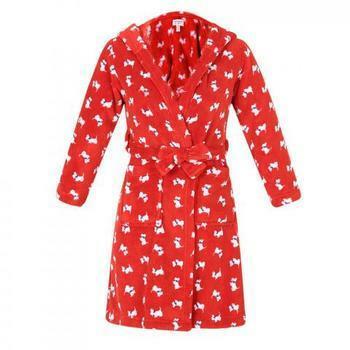 Belle Investment Corporation of Irvine, Calif., is recalling about 1,500 Richie House children’s robes. The garments fail to meet federal flammability standards for children’s sleepwear, posing a risk of burn injuries. This recall involves Richie House-branded children’s 100% polyester robes. They were sold in youth sizes 4/5 through 12/14 and in four different color/print combinations; red with dog print, blue with butterfly print, pink and white with white polka dots and solid pink. The robes, manufactured in China, were sold exclusively at Amazon.com from December 2015, through March 2017, for between $20 and $22. The robes have long-sleeves, a belt and two front pockets. The red robe comes with a hood. “Richie House Los Angeles” and the size are printed on a label sewn into the neck of the robe. Consumers should immediately take the recalled robes away from children and contact Richie House for a full refund. Consumers may contact Richie House toll-free at 844-742-1303 from 9 a.m. to 4:30 p.m. (PT) Monday through Friday, by email at info@richiehouse.com or online at www.richiehouse.com and click on “Recall Information” for more information.